Be sure to catch the next Sonoma County gem on August 19th—an evening of wine, foot baths, music and dinner at Osmosis Day Spa Sanctuary in Freestone. From 6 pm to 9 pm, guests will be serenaded by the Latin-soul-jazz inspired music of Rupa Marya in the meditation garden and enjoy a farm-to-table dinner catered by Fork Roadhouse Restaurant. For only $35, it’s an zen-loving and foodie’s dream come true. This event is only one of many, so be sure to check their website (https://www.osmosis.com/events/) for upcoming events. For those of you who haven’t been to Osmosis, you’re in for a treat. After visiting the day spa last Sunday, it’s my opinion that Osmosis should be written “Ahhh-smosis.” At least, that’s how I was pronouncing it by the end of my visit. Instead of taking your breath away, it brings it back to you. Suddenly, time stretches, an hour seems like three hours, your mindfulness seeming to expand with each deep, restful breath. In our crazy, hectic world, a sanctuary like Osmosis is most needed. Osmosis claims it offers a “pathway to peacefulness.” However he did it, founder Michael Stusser created that pathway, and I walked on it for a while. It was easy to connect with nature as I sat in the Kyoto-style meditation pagoda overlooking the koi fish pond, lured further into peacefulness by the sounds of bubbling waterfalls and chirping birds. For a long time, I watched the red dragonflies zip across the ponds and drink. I watched the golden and red koi fish dart around the white lilies and wiggle up the sides of the pond to nibble algae. My treatment was the unique Cedar Enzyme Bath, a bath actually made up of soft ground cedar, rice bran, and living enzymes. If you’re like me, you love trees. Love to climb them, meditate in them, read books under them. But how often can you say you’ve been encased by a tree? This fermentation bathing ritual originates from Japan, and Osmosis is the only spa on our continent that offers the treatment. It’s the strangest, softest feeling—imagine stepping into a sauna that has been turned into soft fluff, then imagine the fluff pillowed all around you. When you move, it heats up because you are activating the enzymes which then stimulate metabolic activity inside and out. The Cedar Enzyme Bath is known for improving circulation, relieving muscle pain, and deeply cleaning your skin. During the treatment, my attendant Ariel was most attentive, placing cold towels on my face and serving me water with electrolytes to help restore the toxins leaving my body. Before I began the process, I was served a tea made up of nettle, herbs and digestive enzymes, meant to begin the process of cleansing from the inside out (in simple terms, designed to make you sweat). 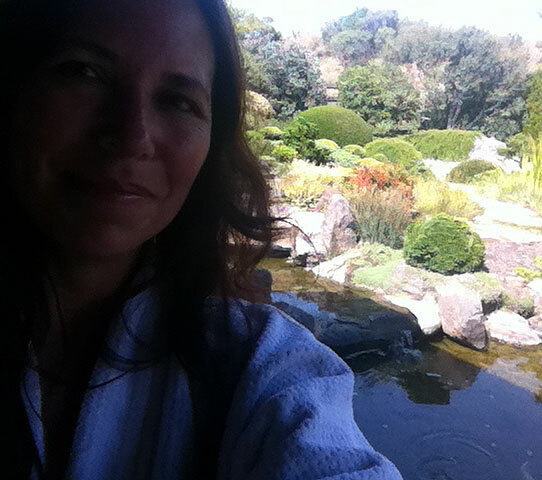 I was served the tea in a room overlooking my very own private Japanese tea garden—which I promptly walked into, exploring the tiny arcing bridge and the shape of the rocks, the tranquil waterfall, the sculpted bonsai trees. After my Cedar Enzyme bath, I received a brain-balancing Hemi-sync sound therapy session on a wide, padded hammock. As I laid there, listening to a soundtrack titled, “Wind Over Water,” I watch the wind move the trees, and then felt it move me, slowly, back and forth. I don’t think I ever have watched the willow trees of Salmon Creek quite as intensely as I did last Sunday. Cabbage butterflies flitted together; an occasional hawkcircled overhead. I wasn’t really sure when the 30-minute soundtrack ended and the real nature sounds began, since there was still the sound of wind, birds, and an occasional chime. The smile that had been forced to my lips at the beginning of the day now floated permanently, effortlessly across my face. It’s now been less than 24 hours since I left Osmosis’ perfectly manicured gardens and ponds, but I’ve called to mind the peaceful scenes I witnessed many times. Already, it’s helped me through the beginning of a fast-paced week. I can’t help but think of Wordsworth’s poem, “Lines Composed a Few Miles above Tintern Abbey,” specifically the references of how memories of harmonious nature can get us through anything, of how even in the din of towns and cities, our memories can fill us with sensations sweet. When you visit, be sure to check out their membership club. One club option is a 75-minute Swedish massage once a month and unlimited access to the tranquil gardens—all for only $99 per month. An organic lunch (catered by Fork Roadhouse) can be savored while you sit overlooking Salmon Creek. Meat-loving and vegan options are available. For tickets to the August 19th outdoor concert and dinner, or to schedule your next spa treatment, contact Osmosis at www.Osmosis.com or call 707-823-8231. The day spa sanctuary is located at 209 Bohemian Highway in Freestone.